After all the chocolate (and other no-nos) that I've eaten this week plus the humiliation that goes with totally failing Poseymom's challlenge, I was sort of feeling like lumping it and trying this weight loss thingy again some other day. I've gotten 3 comments in the last 2 days from people saying I look like I've lost weight. The sky opened up, a bright light shone and I swear I heard the angels singing "HALLELUIA"! I guess I'll keep at it afterall! It's amazing how far a little encouragement will go! Funny thing...On PeerTrainer, someone suggested I commit to 15 minutes of exercise -- just once, to get the exercise ball rolling. Well, I misunderstood, and thought it was a challenge of 15 minutes/day for 1 week. Sounded easy enough! So, I spread the word through my other groups. Some are adding longer daily workouts. Others are adding a longer commitment! People are really doing this! VERY COOL. And today I read that they're calling it Poseymom's Challenge! Sad part is, the initial challenge was 2 weeks ago, and I haven't exercised a minute AT ALL! I guess if the challenge is going to be named after me, I'll have to actually do it. Shame -- now that's a great motivator! New month = fresh start. So, today is Day 1 of Poseymom's challenge, and I WILL EXERCISE at least 15 minutes tonight! Actual weight is quite questionable since my scale is so crummy. If I lean forward or backward, I can make it go up and down in a range of about 10 pounds (Soooooo tempting some days to do the lean that makes it go lowest!). But I've been trying to stand the same way for some sort of consistancy. I do know that my 10 pound range is going down anyway! Thanks again to Lolly! Her renewed motivation has inspired mine. 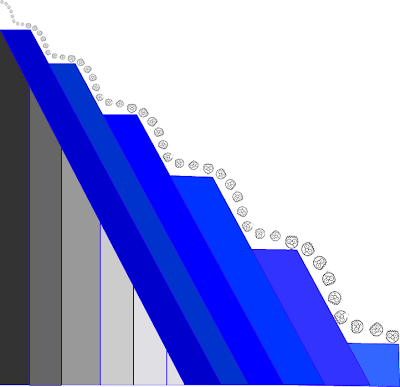 Plus I am really enjoying PEERTrainer! I have a nice group (2 other women) who are 40-something. I'm also part of a team of people trying to lose 100 pounds. Then of course there's LOSIN' KNIT! So they all provide support in different ways. On the knitting front. I finally got to make a pair of Koolaid-dyed socks for myself. They're wonderful -- QUITE colorful. I'll be going on a road trip this weekend, so will probably get in quite a bit of knitting -- probably more socks. Hard to believe how hooked I am on those. Especially when you consider this. Ok, so we've never met. But it feels like we're friends, since we get daily updates from her. Anyway, it looks like there are lolly readers out there who have stopped by here -- that's soo cool! I'm now encouraged to put better content here, since I know people actually read it -- THANKS! Maybe I'll even get out the camera and put something fun to see here too. I've been kicking out the Kool-aid dyed socks lately like crazy. The yarn is so much fun to knit -- with suprise colors all along the way! Who would imagine you could get these colors from Kool-aid?! Let's take it off and keep it off! I've said that before, I know! But this time there's so much support, I'm saying it again. What am I talking about? Weight loss. Support I say? Well, first there's the "Active U" program where I work, encouraging teams to increase activity and track it -- joined it. 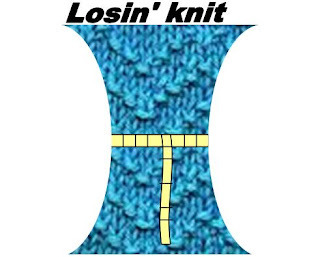 I created a support team: Losin' knit. I'm psyched! The "before" picture I posted there is DISGUSTING -- motivation to fix things and post a better "after" pic. Just a little playing with the colors for February/March. Word sure travels when the entire yarn stock is on sale at 50% off!!! We arrived at the store, saw the parking situation and got our first hint of the crowd that had gathered for this event, but we went in anyway. We had driven 2.5 hours to this great store for their great yarn at a great price, and we weren't going to turn back! Slight concern set in however, that we might not even get into the store before the 1-hour sale was reduced to 40%. But after waiting on the porch for about 15 minutes, enough shoppers left that we were granted entrance and given the precious 50% ticket. Sardines -- that's the imagery that comes to mind -- not the smell, but how tightly packed the shoppers were in this house-converted-into-a-yarn-store. You definitely could NOT walk freely, instead you waited until someone inched over and you could squeeze into the spot they vacated. We patiently worked our way over to the sock-yarn corner where Gaugina picked out a few skeins and I found some beautiful cashmerino & cash/silk to make a nice soft warm wrap for work. Brilliant Plan -- we noticed that the checkout line snaked through the rest of the store entirely. So we decided to get in line now and see what else the store had to offer along the way. See the Red X in the diagram -- that's about where the end of the line was when we joined in. It was hot and stuffy and the line moved VERY slowly. People actually cheered when shoppers would exit the store with their bags of goodies, because it meant possible advancement! Now, the slow pace of the line movement really had nothing to do with the employees (they were courteous and hard-working) it had to do with the sheer volume of yarn that was being purchased! By the time our place in line had moved to be near the store entrance, the line had doubled back on itself like you see in the picture. That's about when the 10:00 hour rang end of the 50% sale. Luckily everyone in the outdoors line at that time received a ticket so they could benefit from this big discount when they eventually gained entrance. The Wait -- actually wasn't miserable, especially once we took off our coats and got a bag for our yarn and got near the fresh air from the entrance door. (Gaugina actually ducked out to run to McDonalds for their restroom and some water while I moved about 1 foot in the line). As you may have guessed, we were surrounded by very pleasant women! We chit-chatted with the 2-in-front and 2-behind for our entire wait -- which turned out to be.... (drum roll)... 3 HOURS! Impulse Buys -- You know how the grocery store has gum and candy in the checkout lane. You don't really plan to buy these things, but somehow they catch your eye as you wait in line. Well, that's how the entire store beckoned to us -- "feel me" "buy me" "what's a little more" "such a bargain at this price" -- or was that our new friends in line encouraging us? Anyway, we succombed a bit and picked up a few items along the way, and the looking and touching was WAAAAAY better than gum and chapstick. Finally -- we reached the register, made our purchase, and said goodbye to our line-mates, with best wishes and hopes of re-uniting at the same sale in a year with stories of finished projects made from these new purchases. Mom of 4, recently back to work. Life is hectic but good. 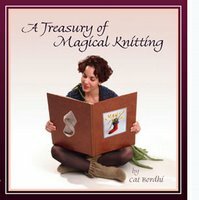 Squeezing in time for knitting and/or beading!